I normally don't post two stream-of-consciousness type posts in a row, but they are sort of my favorite types to read, and I have a few small updates today, sooooo ... here goes. First of all, Camille is down for her afternoon nap now, but we took this photo about an hour ago, and I just love her smile in it. Aww, that girl! Secondly, we had such a fun lunch out yesterday with our friends Sarah and Gigi. We went to The Cowfish. Check out this adorable kid's menu bento box that they offer! Camille had a PB&J "sushi roll" with orange slices and apple sticks. For dessert, they had this little "sweet sushi" for her! 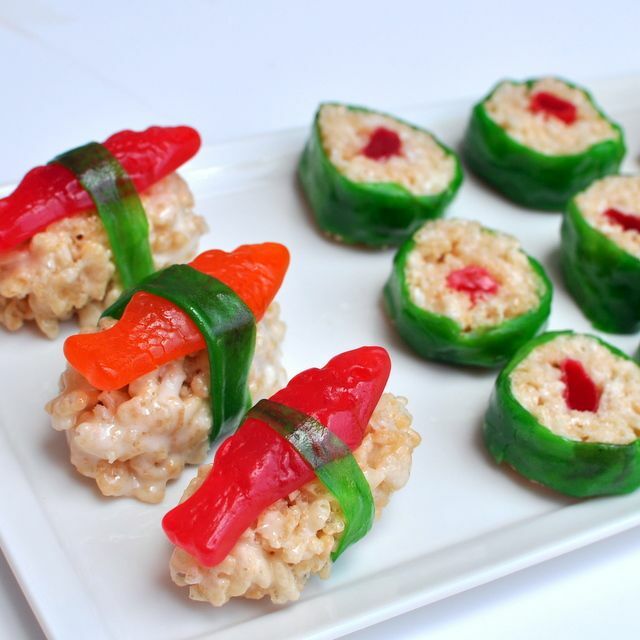 I looked around a bit on Pinterest and found this easy and quick tutorial HERE for making Rice Krispie Treat sushi. I definitely want to give this a shot, and I thought some of you may find it fun to make too. A quick update on the chiropractic visit yesterday. A couple of you mentioned in the comments yesterday that they would probably recommend icing the area over applying heat. DING DING DING! He definitely recommended putting an ice pack on my back for 12-15 minutes each hour (if able) after the three small adjustments he did yesterday. I go back to him later this afternoon and he'll have a plan of attack for me to make sure this lower back pain goes away and stays away! Good riddance. Lastly, since it seems like a good number of you are already Aldi shoppers, or are looking to give it a shot, I'm working now on my top ten Aldi favorites to share. 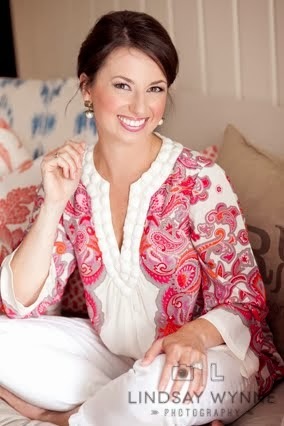 Are there any other blog topics you'd like to see me cover soon? I'm all ears! That sushi is so cute! The rice krispie sushi rolls are seriously adorable!! Good news on Chiro. Everyone thinks heat, I did, then I learned ice, ice and more ice. Hope you are on the road to recovery. You don't have time for this back nonsense! 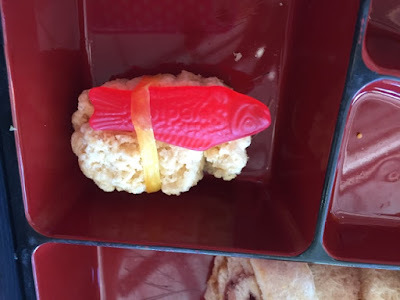 absolutely LOVE the rise krispie sushi idea!!!!!!!!! 1. Camille looks like a little lioness with that smile! 2. Steve had terrible back pain for a while (turned out he had a herniated disc, which it doesn't sound like you have and I really hope you don't!) but his chiropractor recommended icing -- the thinking is that if there's any nerve damage, the muscles around it are swollen and pressing on the nerve, causing the pain. The ice would reduce the swelling and allow the nerve to heal. He also took several homeopathic anti-inflammatory remedies, which he had some luck with. Good luck! Sweet little Camille! Love when kids do the scrunched nose face - the best! We don't have an Aldi's but I am always looking for good dinner ideas for the littles. Annies...we eat way too much of it over here. I agree with the comment above and love the idea of sharing meals - especially ones that you guys eat with Camille. We try to make meals that Mason will eat too but sometimes it doesn't happen, but I hate having to make an additional meal for him (though it's usually mac and cheese lol) so any family friendly meals would be appreciated! I love those bento boxes and they would be so easy to make at home too! I hope your back is feeling better soon. We just got an Aldi so I'd love to see your recommendations. I haven't ventured there yet. These types of posts are my favorite to read too! What a cute and fun lunch place! I'd love for you to do a post on what you and Camille do now that you're at home. 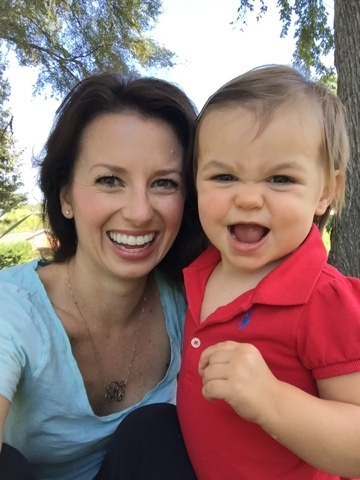 I'm a SAHM too and I find myself running out of things to do with my little guy. What a fun lunch for a little one at a restaurant!! And that sushi is so cute & fun!! 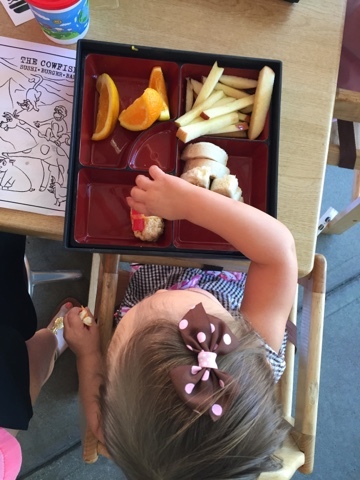 Our favorite place to eat is Kona Grill and they have these SAME bento boxes for kids' meals. LOVE. We ate at Cowfish on Sunday and M had an almost identical meal! Love this little pb&j rolls!! Also....YES to the ice!! I had always done heat until he told me to do ice and it really does make a BIG difference. I use it on adjustment and non-adjustment days now....when I can! I Have evn rigged up a scarf around my body to keep it on me while I chase M around! what?! cowfish does kids plates? that's too adorable!! !